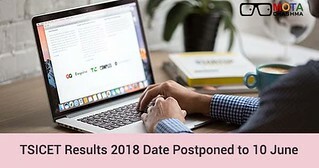 TSICET Results 2018, which was scheduled to be declared on 6 June 2018 is now postponed to 10 June 2018. The conducting authority, Kakatiya University, Warangal will announce the TSICET Results 2018 for the exam which was conducted on 23 and 24 May 2018. The link to check the ICET results is available on this page. The candidates who have appeared for the TSICET 2018 will be able to check their TSICET Results 2018 from the given link. The candidates will have to wait for a bit more. However, before the final TS ICET 2018 result, Kakatiya University has already released Preliminary Answer Key on 27 May 2018 and candidates calculated their probable score with the help of Preliminary Answer Key. Telangana State Integrated Common Entrance Test, commonly known as TSICET was conducted at the various exam centres within the Telangana state by Kakatiya University to provide admission to MBA and MCA programs in the Universities located in the State of Telangana and its affiliated colleges. This year, total 61,439 candidates appeared for the TSICET exam. STEP – 1: Click on the given link or visit the official website www.tsicet.co.in. After that, the candidates have to click the option to check result. STEP – 2: Enter the credentials i.e. registration number and password and the Result will appear on the screen. STEP – 3: Download the TSICET result and take the printout of it. The candidates will have to produce their TSICET result card during the counselling process. The qualifying marks percentage for TSICET 2018 is 20%. The candidates will have to get 50 marks out of 200 in order to qualify the exam. Apart from that, there is no minimum qualifying marks prescribed for the reserved category candidates.